Are you waking up with headaches or jaw pain due to teeth grinding? Are you worried about the long-term damage being done to your teeth every night? If you suffer from teeth grinding, your dentist has probably recommended the solution: a custom night guard. The problem: your dentist charges $400 - $800, or even more, for it. Don’t overpay at the dentist. You can order a professionally made, custom dental night guard online. ProTeethGuard.com lets you order a custom night guard directly from a professional dental lab. Order online, take your own teeth impression using our home impression kit, and we will create a custom dental night guard and ship it to you. Get the exact same professional quality sleep mouth guard at a fraction of the price! You may have gotten a night guard from the dentist before, but did you know that dentists don’t actually make the night guards? After they take an impression of your teeth, they send the impression to a professional dental lab. The dental lab custom makes the night guard based on your teeth impression and sends the completed night guard back to the dentist. While your dentist may charge you anywhere from $400 to $800 for a night guard, it only costs a fraction of that to make it. ProTeethGuard.com allows you to order a custom night guard directly from the source: a professional dental lab that specializes in making night guards. You save by ordering online because you’re getting the “factory direct” price and you avoid the markup charged by your dentist. ProTeethGuard.com is operated by a professional dental lab in San Diego County, California. We’ve been in business for over 10 years and have delivered thousands of perfectly fitted night guards, dentures, and other dental appliances to patients. We use the same professional materials and process when making the night guards for our online customers. Every night guard you purchase from ProTeethGuard.com is covered by our commitment to your comfort and satisfaction. 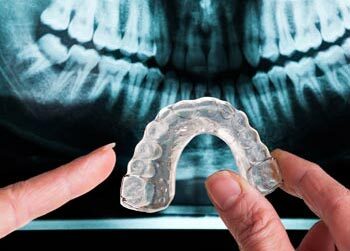 We’ll do everything we can to make sure that your custom night guard fits comfortably. If you’re not 100% satisfied with your custom night guard, you’re entitled to 110% of your money back (yes, that’s 10% more than you paid)! Ready to put an end to teeth grinding? Teeth grinding (also known as bruxism) occurs during sleep for some people. Occasional grinding and clenching can be related to stress and may come and go. It’s usually not a problem unless it becomes a constant habit. Habitual, long term bruxism can lead to serious damage to the teeth and jaw joints. Long term grinding can wear down the enamel of teeth and cause tooth pain. In addition, the excessive forces (up to 200 pounds) generated during teeth grinding can cause wear and tear on the jaw joints, leading to TMJ. A custom night guard (also known as a dental night guard or occlusal guard) effectively repositions the jaw and keeps the teeth from grinding. The custom made guards are typically thinner and lighter in weight than those that are bought off-the-shelf. This makes them easier to wear comfortably and enables the user to even talk freely with the guard on. A custom fit insures that the placement of the guard is appropriate as each person's set of teeth is different and there are no two alike. The night guard should be used regularly for the best results possible. It is important that the custom night guard fits properly in order to prevent dental issues. The night guard will be created first by taking an impression of the user's teeth. This is done by using a specialized material that allows the individual to bite down and leave an impression of their teeth. The impression is then used to create a mold for the guard for the individual. Using a special dental plastic material, a mouth guard that is a perfect match for the individual's teeth is created. The custom mouth guard will hold the jaw in place while the user is sleeping, keeping him or her from grinding teeth. When purchasing a custom night guard for teeth grinding there are a couple of options. One option is to contact your dentist and make an appointment. Your dentist will look over your teeth and see if there has been any damage due to teeth grinding. They can then take your teeth impression for a night guard. Once they do that, the impression will be sent out to a professional dental lab so that your custom guard can be created. The completed night guard is then sent back to your dentist and given to you. You will then likely have a follow up appointment to ensure that the guard fits properly and that you know how to use the guard. While this options is a good one it can be expensive and might take a bit of time to accomplish. Alternatively, you can purchase a custom night guard for teeth clenching or grinding online right here at ProTeethGuard.com. When you order a mouth guard online, you will receive a dental lab kit in the mail. This kit will have specific instructions on how to use what is included to make a good impression of your teeth. Once the impression is complete you will return it in the included packaging to our professional dental lab. From there your bruxism night guard will be custom made by our professional lab and sent back to you. The cost of this process is less than going through your dentist. You will also save a good deal of time. P.S. : We're committed to your complete comfort and satisfaction. All purchases are covered by our 110% Money Back Guarantee.